Once the main body of my jungle had been built and a few buildings had been added it became apparent that I needed some jungle roads or tracks. I thought that I would share my simple method of making roads quickly, easily and cheaply! First of all buy a cheap pack of self-adhesive vinyl floor tiles. The ones I obtained were 12 inches square and I cut them into strips each 6 inches wide. I wanted a road of 2 inches width so, on the backing paper of the tile I marked the edges at 2 and 4 inches, then I drew the rough outline of my road between these markers as you can see in the photograph above. Next I used a sharp craft knife to cut away the backing paper following the rough outline that I had drawn. This exposed the sticky side of the tile as you can see here. I then poured sand coloured flock onto the sticky surface and pressed it down. This represented the surface of my road and as soon as it was in place I removed the remaining backing paper exposing the rest of the sticky surface; onto this I poured green flock and lightly pressed that into place. That's it, a road made in minutes! 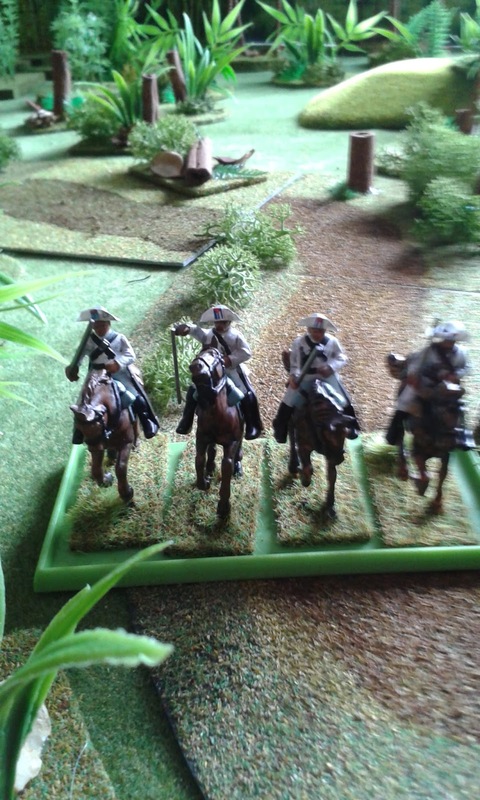 Here are a couple of finished road sections patrolled by a Spanish infantry column. I have added reindeer moss, tree stumps and other bits and pieces to enhance the effect. By the way the tree stumps are made from cinnamon sticks, a packet of ten from the floristry section of our local garden centre coast me just 99 pence! 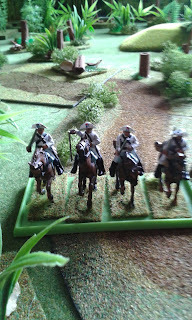 A small group of Cuban cavalry galloping along a couple of curved road sections. If you are making curves like this think carefully about marking out the tile so that the roads interconnect properly. Of course this simple method of making roads and pathways can be used for any period and scenario of wargame. Cut straight lines and use a tarmac coloured flock for modern roads; finish them off by sticking card to the sides, draw lines on them and you have pavements. Likewise you could stick pre-printed paper in the centre to represent cobblestones or some other surface and again finish the sections off with cardboard pavements to the sides. The different adaptations are endless and should furnish you with whatever roads you need!